The first chapter is Erma and Feima, with new information about how these companies were connected, not previously known to the collecting community. The Berlin-Lübecker factory is covered with period documents and photographs and thorough coverrage of the ZF-41 sharpshooters rifle development. Gustloff-Werke is covered from the very beginning, right at the break from BSW/Simson, continuing until the end of 1944. The Steyr factory chapter is filled with period documentation detailing the factory and it's satellite plants. 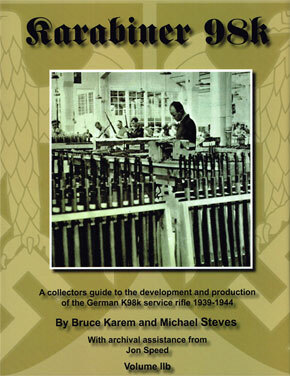 The last chapters cover the Czech and Slovak factories , reworks and depot builds, and a full chapter on SS rifles and variants. The final chapter covers the accessories used by the soldiers armed with the K98k. Excellent !! H/C. 477p. VOL.II A & VOL.II B ARE SOLD ONLY AS A SET!! !